When you think about a blush or foundation brush, typically you’d think of a brush that is somewhat fluffy, right? Well, sometimes great brushes come in somewhat smaller sizes than you would expect! And for comparison’s sake, right next to the e.l.f. Studio Contour Brush that Leticia recommended and I had to purchase. It’s just as great as she says, by the way! So, why do I love this much smaller brush? 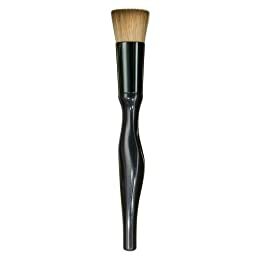 Because of its compact bristles, it is so good for applying creamy products to skin, buffing the products in so makeup is blended to perfection. The small size also makes the brush great for applying contouring and highlighting products where needed, but I tend to use it mostly for foundation, cream blush, and also for applying powder right on top of my concealer. In the following photo I’m using the brush to apply and blend in Stila’s Rose cream blush and achieve a natural flush. For a lower-priced alternative to MAC’s 109 brush, which retails at $32, I also highly recommend Sonia Kashuk’s version, which retails at $14.99.